Exposure to irritating outdoor pollutants or allergies can lead to aggravating the risk of asthma in an individual. While it is possible to reduce this risk when you are indoors (by making use of air purifiers or vacuum cleaners), you cannot take this liberty while you are roaming outside. Well, to offset this risk, you can make use of a breathing mask. Asthmatic patients can make use of such breathing mask for asthma during extreme winter climate (and also in dry summers) enabling them to breathe easy and reduce the triggers. However the breathing mask you buy, need to fit in to your requirements and should enable you to protect with appropriate filtration need, this is when the need for buying guide plays an important role. Here we help you find the best types and options that are available for you so that you do not end up buying a useless dust mask that does not help at all. But before we get into those details, let’s find how these breathing masks work and benefits. What Is A Breathing Mask And How It Work? Why Breathing Mask for Asthma is Important? Asthma or an allergy mask is a simple yet sophisticated device which can be worn to cover the nose and mouth while you breathe. Made up of materials such as cotton, microfiber, woven cloth, plastic or even paper; these asthma masks can be worn easily by using the attached hooks (for ears) or straps (for neck or head). These masks works as an outdoor air purifier which are especially designed for people who need to get the protection from the polluted environment, while they travel, exercise or work outdoors. Based on the work and need, different kinds of allergy face masks are now available to serve different users. While HEPA or Particulate Arrestance is the best option to filter particles such as dust, pollen, dander, etc; Carbon activated charcoal is used for filtering chemicals present in exhausts, odors and industrial pollution. Advanced allergy masks with a combination of these two filters are also now available in the market which not only prevent allergens and particles to pass through but also captures harmful bacteria and chemicals present in the environment. Irrespective of the climatic condition, the air we breathe in is filled with pollution particles and pollen that could aggravate breathing issues in an individual. Wearing a breathing mask while exercise, working or staying outdoors can reduce your risk of exposure to such pollen filled in the air. Such kind of breathing masks benefits by filtering out the fine dust particles of tiny allergens that are most of the times the possible triggers for asthma sufferers. Asthmatic patients can make use of such asthma face mask during extreme winter climate (when the asthma symptoms are worse) enabling them to breathe easy and reduce the triggers. Masks for breathing were previously designed simple using a soft cloth material or tightly woven fabric that helps in stopping the allergens/particles to pass through. However today with the varied demands of the users and enhanced technology, manufacturers are now making them more fashionable, stylish and feature-rich. Therefore, if you want to get a best asthma mask for running or exercising outdoors, do not just compromise with a simple one made up of cotton or silk cloth material. Instead you should go for a feature rich mask that comes with high quality filters and a built-in valve or air filter to help exhale the air out and to prevent generating the heat. Whatever the pollution levels are present outdoors, a high quality anti-pollution breathing mask for asthma can help you breathe pure fresh air all the time. In case you are planning to buy one, below are the 10 top options available to keep your asthma symptoms at bay. Check the detailed allergy mask reviews below before you buy one. 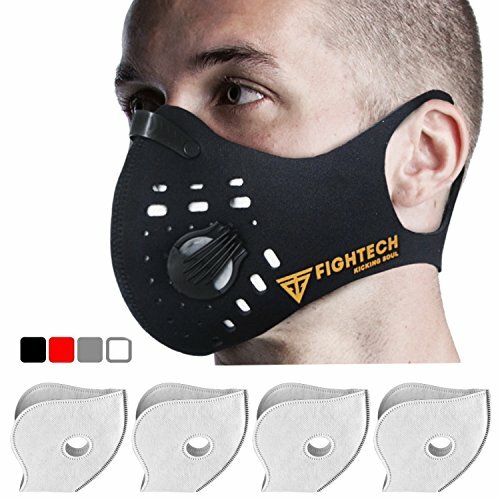 This Cambridge Mask Co PRO Anti Pollution N99 Washable Military Grade Respirator is uniquely designed and lab tested with military filtration technology. The filter used in this mask helps to remove or filter out respiratory syndrome caused due to pollution, gas, viruses or bacteria. This mask is ideal for people who are allergic or live in areas with acute pollution or high smoke. The unique feature about this Cambridge mask is that it is clinically tested and comply the specifications for pollution masks in the US. The test results were positive and are capable of filtering out almost 99.7% bacteria and other harmful substance that could be of harmful effect on your body. Other than people living in high smoke zones, this respiratory mask is also suitable for people with respiratory disease, asthma patients and people indulged in carpentry work. 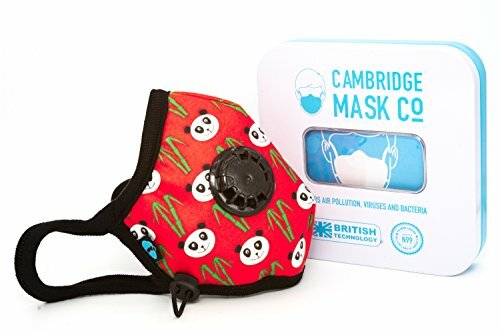 This Cambridge mask for pollution comes with adjustable straps and is easy to clean and maintain. In case you love traveling, then it is ideal for you to have this adjustable mask. The Breathe Healthy face mask provide its users with an easy and simple solution to respiratory syndrome that otherwise might be impossible to deal. This mask is comfortable and effective for daily use while also providing you with opportunity to wash and reuse it. This mask is environmental safe and provides you with lasting support for up to 100 wash.
People tend to use this Breathe easy mask to protect self from infection caused due to flu, dust, allergy, asthma, pollution and extreme climatic condition. If you are planning you trip to China or India, then it is advisable for you to keep this respiratory mask handy. In case you are directly exposed to pollution or pollens circulating in the air then you are always at a high risk of getting self infected to respiratory problems. This can be avoided with the help of breathe healthy masks that is light and comes in vibrant colours for you to choose. Made with pure cotton, this washable mouth mask by Servefox comes along with two replaceable filters. It has stretchy and adjustable earloops that makes it suitable to meet any head type. 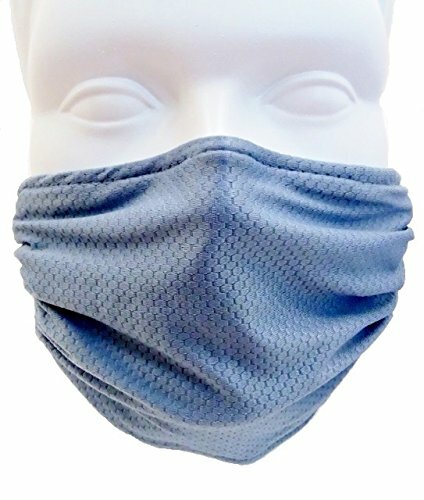 This face mask comes in an attractive grey colour and is suitable for any kind of outdoor activities such as running, cycling or skiing. The replaceable filter is made of carbon fibers and helps in eliminating any kind of dust particles that shall hinder your breathing pattern. This activated carbon dust proof mask is made in a standard design and adjusts self to facial features of user. 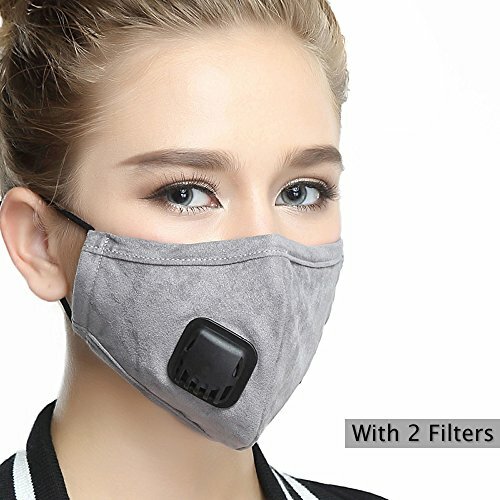 Other than outdoor activities this charcoal filtered face mask can also be used by people working in the industrial setup. The filter fitted inside the mask is replaceable and the best practice shall be to change in once in every 45 days. This also makes it easy to wash and maintain with better drying process. 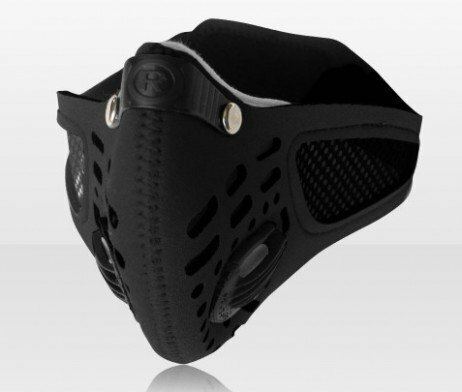 This military grade mask by Muryobao is washable and comes with unique feature along with five replaceable carbon filters inside. It is made of pure cotton making it comfortable for users and providing better absorbent of moisture. The masks and filters are individually sealed inside the box and the user manual along with the package shall help users to fit the carbon in the mask while using it. This is ideally suited for outdoor activities like cycling and running and for people working in industrial set up or jobs that generate huge amount of dust particles around you. This military grade mask is made of four different layers to provide better protection against dust and other pollens from affecting you. The first layer is skin friendly cotton, second a silica gel layer, third is the cotton lining and the fourth layer has filters that are already carbon activated fitted inside. The nose bridge portion of the mask is adjustable making a perfect sealing feel while you are wearing the mask. This mask is undoubtedly a perfect combination of ergonomics and takes into action the job of protecting users from respiratory infections. This mask is adjustable and fits into Nose Bridge effortlessly. It has an aluminum sheet fixed that helps mask to stay in its place rather than sliding and make users uncomfortable while working. This dustproof mask is best suited for outdoor activities like running and cycling. However, this mask is also an ideal solution for people working in heavy industrial set up. This allows for smooth breathing and the valve in the face mask open and close so as to prevent moisture retention. This mask shall help its users to protect from pollution, dust, pollens, chemicals and fumes that shall considerably affect breathing pattern of a human being. This mask is made of user friendly material that is light weight, soft and allows for quick drying. The fabric breathable and make it comfortable for users to wear it while they carry on with their daily activities. 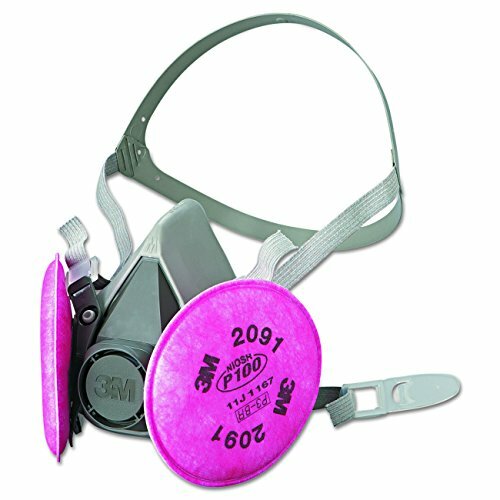 This 3M face mask respirator for asthma not only helps in breathing but also by protecting from spray paint, asbestos, fumes, etc. Therefore when properly assembled, this respirator mask helps in providing best protection while using it for variety of industrial applications like welding, torch cutting and brazing. The 3M allergy mask is designed for the maximum comfort of the users and is made of skin friendly material which is soft and lightweight. The mask is tested for quality and can withstand heat as per standards in Permissible exposure level. It comes with adjustable straps which can be removed easily. The filters of this 3M face mask can be replaced as and when required by user (usually once in every 45 days or 30 days based on your usage). The key advantage of this respirator is that it can be assembled and disassembled based on your convenience, this shall also help in providing longer life to the product. This Respro sports mask is suitable for men and women alike. It is adjustable and fits comfortably on users face without giving a mere chance of irritation. 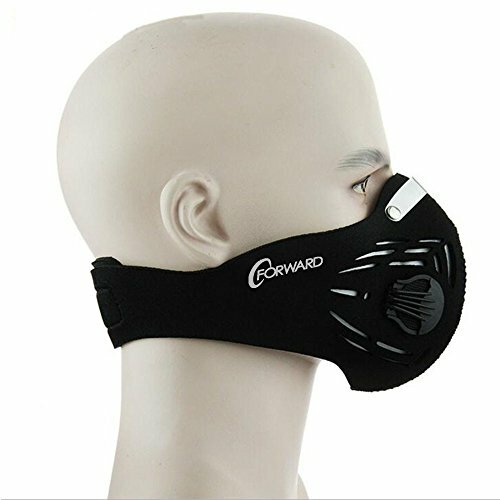 This asthma mask for runners shall look like a huge cover on your face with a giant band covering the bridge of your nose and then covering skin below your ears and at the back of the neck. But believe me, its quite effective! You can make it tight based on your need; however this shall provide a feeling of tightness to your nose. While this respro allergy face mask is reusable, you need to be pretty careful every time you remove and wear the mask for re use. There are chances that the filter moves from its usual place making it difficult for you to use. This mask is available in black colour and is made from neoprene, available in two different sizes. The Velcro attached to the Respro allergy mask makes it easy to adjust according to user convenience. Medium size is most suited for women and shall help in providing an additional layer of support to protect from dust and pollen in the air. The best and by far the most preferred mask in the market. This mask is designed with the unique feature of letting moisture not stay inside the mask and vents out moisture and CO2 from inside the mask. This allergy mask for sleeping comes with an adjustable head strap that can be purchased separately; this shall ensure there is proper fit for the mask. The ear loops are trim and is made from latex from spandex that are skin friendly and provides ultimate comfort to users while wearing it. Yet another added attraction of this face mask is that, manufacturer provides its users with a size guide that can be taken into account before you buy your mask. This shall make it easier for you to choose the right size for you rather than adjusting from standard size available in market. All vogmask sellers provide a guarantee replacement or 30 day money guarantee to every user who did not find the product useful or worth the money. This anti pollution dust-proof mask by Fightech comes with 4 activated carbon filters and valves that shall provide complete protection against any kind of respiratory trouble while you are outside or working in an industrial set up. 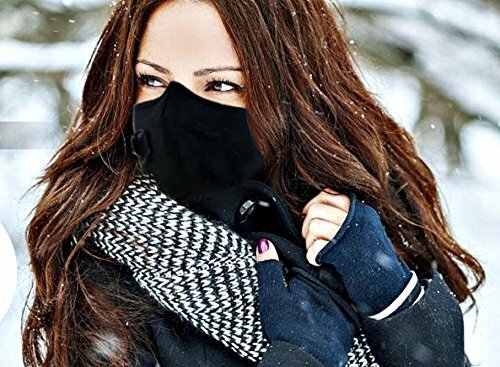 This cold weather mask for running helps with healthy breathing option and the carbon filters attached are replaceable ensuring up to 99% of dust particles are eliminated. 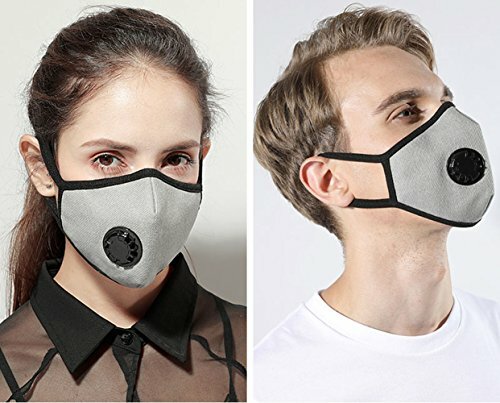 This mask shall allow you to adopt a cleaner and healthier lifestyle thereby increasing the efficiency of your lung capacity. This is because you do not inhale any contaminated particles into your system and is also training your lungs to live in extreme high or low oxygen levels. The dual one way valve in this anti pollution Fightech mask allows for better exhaustion of heat and CO2 trapped inside the mask. This makes it easier for users to breathe and let them stay comfortable while wearing it. This Fightech mask is light in weight and can be adjusted based on user requirement, the easy cleaning options is an added advantage that you get while purchasing this mask. Engineered Essentials Co. is your perfect mask for all conditions. This military grade respiratory mask is anti-pollution and is made with soft cotton and comes with individual packing and is made of highest standard material. This asthma running mask is designed keeping individual standards of design in mind ensuring that mask fits properly on every user using it. This mask is also designed to provide comfortable and not an irritated feeling to its users while wearing it. This mask by Engineered Essentials Co. can be washed and reused as per convenience of users. The only challenge while using this mask is that you need to change the filters once in every 30 days for better efficiency and performance. This mask comes with an easy seal bag making it easier for you to carry anywhere you travel. This mask come with two free filters along with the package and you can use this for every replacement that comes your way. While the above mentioned options works for most, it is important for you to choose a breathing mask for asthma that cater to your specific needs. You cannot just choose a breathing mask because it works better on your friend or spouse. Careful attention and buying factors need to be considered while you are choosing the best type of mask for your health condition. You buying guide to breathing mask for asthma can be tricky and before you make your choice, make sure to find answer to the following few questions. Particle filtration (or HEPA) is the most common used filter and helps to protect against pollen filled in the air. This also help reduce spread of flu and other viruses. 2- Life of the filter: Nowadays asthma and allergy masks comes in various different types like disposable, replaceable filters and hand washable filters. Most of these are good for everyday use like while walking, running, gardening or mowing, etc. While the disposable masks can be used only for 1-2 times, masks with replaceable filters can be used for about 50-60 times and is usually dependent on lifestyle, work life, environment you live in and the way you take care of mask. Some of these masks can be simply washed before using it next time and these comes at an affordable price. Based on the time you will wear the mask you can choose the one that is just right for you. 3- Style and functioning: Now this could seem a little confusing because in general terms masks are either simply masks or respiratory masks. The difference may not be evident but in case of respiratory masks or respirators there is small valve that is attached allowing for moisture and heat to escape. Respirators are used mostly in industrial setting environments whereas normal asthma masks are good for daily use. These come with different size, shape and colors to choose from. 4- Size: Size of the mask you choose is also important as many of them may not come with an adjustable feature. Make sure that you choose the right size based on the sizing specifications provided by the manufacturer or else you will have a hard time to adjust it comfortably according to your needs. 5- Rating: Last but not the least, check online and offline on the market ratings of the allergy mask that you chose, before making a final buying decision. Also make sure that the mask you choose is certified for asthma and allergy patients. Comparison and consumer reviews shared by earlier users can help you narrow down your choice to minimal while also understanding experience of other users. Whichever mask you choose for your breathing problems and allergies, ensure that you store them with proper care so that you can reuse it again when needed. The way you need to store the mask actually depends on the type of mask you have. Allergy masks with particulate filters do not need any special storage and can be simply kept at place which is free from direct sunlight and moisture. Whereas the mask with activated charcoal or carbon need to be placed in a container which is perfectly air tight. These can continue to absorb impurities and odors if kept outside, making it less effective for wearer when used next time. Storing your asthma and allergy mask properly can help enhance the durability of the mask. This refrains you from buying it again and again within very short period of time. I personally love using my Breathe Healthy honeycomb face mask while running, exercising, mowing, dusting indoors, etc. As it requires very less maintenance and care I can reuse it for long without any hassles. Overall, a well fitted breathing mask can help you in reducing the exposure to irritating outdoor particles while also protecting you from chemical fumes, dust and other particles. Such particles are not visible to human eyes; however the risk they possess to human health is inevitable, especially when you suffer from breathing problems such as asthma. So why not get a mask for your daily needs to start living healthy and risk-free.